The EUR/USD is moderating around 1.45 as the wires begin to heat up for the first time this with an ECB policy meeting and U.S. Retail Sales headlining on Thursday. The ECB is expected to keep its monetary policy intact despite a bit of discouraging data as of late. The ECB may tighten its language a bit with the lingering possibility of an announcement concerning the removal of an alternative liquidity measure due to the confident language emitting from central bank representatives. Meanwhile, U.S. Retail Sales could print well on Thursday since today’s U.S. Trade Balance showed imports outpaced exports. For the time being, investors are digesting news that China is increasing its level of required reserves for banks. Today’s announcement coincides with an 8 basis point increase in the yield for 1-month bonds. Hence, governmental authorities are sending a clear message to financial institutions that they better ease up on loan issuance. That being said, China will release New Loans data in the coming days. Extra emphasis could be placed on this data point since the term ‘overheating’ has become synonymous with China. Along with news from China, earnings from Alcoa kicked off the earnings season on a sour note. However, earnings won’t shift into first gear until next week. As for the EU, the wires should be quiet until the ECB meeting on Thursday. As a result, the EUR/USD’s movements between now and then could be tied closely to the currency pair’s Dollar correlation. Technically speaking, we’ve readjusted our downtrend lines to compensate for yesterday’s nice topside breakout. That being said, the EUR/USD does have quite a bit of room to make up for considering the extent of December’s decline. Therefore, the EUR/USD does have some more obstacles to overcome, including 12/16, 12/14, and 12/11 highs. Meanwhile, the EUR/USD has broken through previous January highs after building a solid based above December ’09 lows. The EUR/USD has bought some more breathing room to the downside in the process, including multiple uptrend lines along with 1/8 and 12/22 lows. The Cable is consolidating above our uptrend lines and the psychological 1.60 level as the EUR/USD experiences similar activity. Investors seem a bit indecisive as they digest liquidity tightening in China along with a downbeat earnings report from Alcoa. Meanwhile, Britain’s Trade Balance printed in line with analyst expectations, continuing a theme of strong UK data. However, more attention will likely be placed on tomorrow’s Manufacturing Production number. A solid Manufacturing Production figure could key a pop in the Pound since UK data has been encouraging so far this month. Hence, investors should keep an eye on activity in the EUR/GBP for a directional movement. Meanwhile, the highlight of the week is still on deck with U.S. Retail Sales and an ECB policy meeting on Thursday. Strong U.S. Retail Sales could deflate recent strength in the Cable, while a weak number would likely entice investors to sell off the Greenback and head for the risk trade again. Any dovish language from the ECB could create speculation that the BoE will approach its monitory policy with a similar attitude, a positive catalyst for the Cable. Overall, the contrasting headwinds are keeping the Cable and EUR/USD at bay and we will have to wait and see how upcoming data and news impact the Dollar. Technically speaking, yesterday’s rally has created some breathing room between present price and the psychological 1.60 level once again. However, the Cable still faces multiple downtrend lines along with previous January highs. Furthermore, the 12/9-12/15 trading range could prove to be a solid barrier should it be reached. Therefore, quite a few obstacles remain considering the extent of December’s downturn. As for the downside, the Cable has multiple uptrend lines serving as technical cushions along with the psychological 1.60 level and previous January lows. Meanwhile, our 3rd tier uptrend line and 1st tier downtrend line are headed for a collision and we notice a similar occurrence in the EUR/USD. Hence, the FX markets could be in for some volatility soon. The USD/JPY is dropping like a rock today in a delayed response to the recent return to the risk trade we mentioned in yesterday’s commentary. After printing strong Trade Balance data, China announced its second measure this week to tighten liquidity by increasing its rate of required reserves by 50 basis points. China’s effort to curtail its economic growth tells us its economy may be speeding ahead faster than anticipated, a positive sign in regards to Japan and developing nations as a whole. However, China’s more hawkish approach monetarily could curtail global growth in the medium-term should China up its measures over time. Meanwhile, Japan Airlines tumbled 45% during the Asia trading session after it became clear the company would have to file for bankruptcy. Japan Airline’s pending bankruptcy could be a driving force behind a stronger Yen, though this seems counterintuitive. That being said, investors should keep an eye on broad based activity in the Dollar since today’s pullback in the USD/JPY could be foreboding of a pop in the EUR/USD and Cable. Investors are anticipating tomorrow’s Core Machinery Orders data along with the release of the Fed’s Beige Book. However, focus remains primarily on Thursday’s U.S. Retail Sales data since a recovery in U.S. consumption bodes well for Japanese manufacturers and exporters. Technically speaking, the USD/JPY’s has sunk beneath previous our 4th tier uptrend line and previous January lows, a negative development trend-wise. The next test will be our 3rd tier uptrend line and 12/24 lows. Should these cushions give way the USD/JPY’s downward momentum could accelerate towards the highly psychological 90 trading range. As for the topside, the USD/JPY faces multiple downtrend lines along with 1/06, 1/04, and 1/08 highs. Gold is hovering back around its psychological $1150/oz level in reaction to consolidation in the EUR/USD and GBP/USD. However, gold has gained some nice upward momentum so far this month after separating itself from the highly psychological $1100/oz area. Meanwhile, we notice trend line inflection points approaching in both the EUR/USD and GBP/USD. Hence, despite present inactivity the FX markets could be headed for some volatility. That being said, investors should monitor for any trend-setting movements in the major Dollar crosses, primarily the EUR/USD, GBP/USD, and AUD/USD, while keeping gold’s negative correlation with the Greenback in mind. The Fed will release its Beige Book tomorrow followed by key employment data from Australia during the Asia trading session. Furthermore, we’ve got U.S. Retail Sales and an ECB meeting coming on Thursday. Therefore, activity in the markets could heat up for the first time in 2010. Technically speaking, gold has multiple uptrend lines serving as technical cushions along with intraday, 1/8, 12/30, and 12/22 lows. Meanwhile, gold’s psychological $1150/oz area could continue to play a role for the near-term. As for the topside, gold faces technical barriers in the form of 12/7 and 11/18, 11/23, and 11/27 highs along with the psychological $1175/oz level. Crude futures are under selling pressure today as meteorologists anticipate the cold front in the Northeast will begin to abate. Crude futures are sinking despite weakness in the Dollar and relative stability in the S&P futures. Hence, today’s decline in crude shows us the influence cold weather was having on the futures during their recent run. Meanwhile, crude does have a couple uptrend lines to fall back on along with the highly psychological $80/bbl area. Therefore, investors may want to view today’s pullback as a symptom of overbought conditions. Meanwhile, investors are anticipating Thursday’s U.S. Retail Sales release. Thursday’s retail data should give us a good idea of how consumption is faring in the U.S. A strong report could help buoy crude and keep the futures locked in their new uptrend while a negative release could have the opposite impact. Furthermore, earnings season will get into full swing next week and the results could have a considerable influence on the near-term direction of crude and equities. Technically speaking, crude faces topside barriers in the form of 1/5 and 1/10 highs along with the psychological $85/bbl level should it be tested. As for the downside, crude has multiple uptrend lines serving as technical cushions along with 1/6 and 12/30 lows. 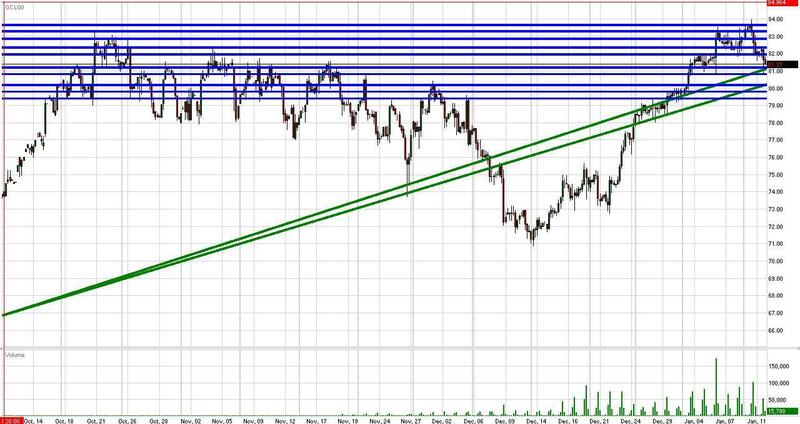 Furthermore, the psychological $80/bbl level could prove to be a reliable support area. The S&P futures have started off the session in the red in reaction to a combination of liquidity tightening measures in China and negative earnings from Alcoa. Alcoa earnings disappointed the street after the bell, beginning the earnings season on a downbeat. However, earnings season won’t kick into full gear until next week. Therefore, this week’s earnings stream may have a limited impact on equities. On the other hand, JPMorgan’s earnings could move markets should the numbers surprise in either direction. Meanwhile, China made its second signal that it is serious about reigning in liquidity for fear of rampant inflation and excessive hot money being invested in speculative assets. China increased the required rate of reserves for banks by 50 basis points following an 8 basis point increase in the yield for 1-month bonds. Although these new monetary measures may not have too much of an immediate impact on the economy, further hawkish actions from China could slow global economic growth over the medium-term. For the time being, investors are digesting a larger than expected U.S. trade deficit. U.S. imports outpaced exports, a positive sign for U.S. Retail Sales due for release on Thursday. A strong Retail Sales report would be a welcome development for the S&P futures. Meanwhile, the Fed will release its Beige Book tomorrow in conjunction with the Federal Budget Balance. Fed officials have reiterated their preference for a loose monetary policy for the foreseeable future. Hence, investors may not receive much of a surprise from the Beige Book. Meanwhile, investors should monitor activity in the Dollar. The EUR/USD and GBP/USD are hovering around key psychological levels while our trend lines approach their respective inflection points. Hence, the FX markets could be headed for some volatility soon. That being said, another downturn in the Dollar could help push the S&P futures higher due to correlative forces.